The "spellbinding" (People, 4 stars), New York Times bestseller from the author of The Rules of Magic and The Dovekeepers: an extraordinary novel about an electric and impassioned love affair—"an enchanting love story rich with history and a sense of place" (USA TODAY). Coney Island: Coralie Sardie is the daughter of the impresario behind The Museum of Extraordinary Things, a boardwalk freak show that amazes and stimulates the crowds. An exceptional swimmer, Coralie appears as the Mermaid in her father's "museum," alongside performers like the Wolfman, the Butterfly Girl, and a one-hundred-year-old turtle. One night Coralie stumbles upon a striking young man photographing moonlit trees in the woods off the Hudson River. The dashing photographer is Eddie Cohen, a Russian immigrant who has run away from his father's Lower East Side Orthodox community and his job as an apprentice tailor. When Eddie captures with his camera the devastation on the streets of New York following the infamous Triangle Shirtwaist Factory fire, he becomes embroiled in the mystery behind a young woman's disappearance. New York itself becomes a riveting character as Hoffman weaves her magic, romance, and masterful storytelling to unite Coralie and Eddie in a sizzling, tender, and moving story of young love in tumultuous times. 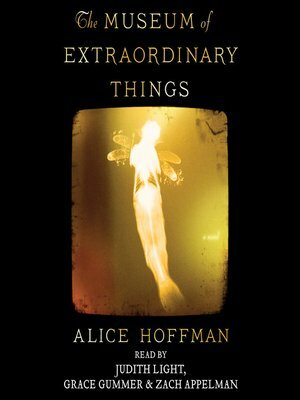 The Museum of Extraordinary Things is Hoffman at her most spellbinding.